ESPN's televised Great Outdoor Games has continued to gain popularity in the summer months with many different events for outdoor enthusiasts. If you are interested in outdoor activities, then you probably have seen or heard about the Great Outdoor Games held in July since 2000. One event that caught my attention was the "Big Air" competition. This is an event that measures how far your canine companion can jump from a dock landing in a body of water. This is a very popular event, drawing large crowds. People enjoy seeing the dogs in action and doing something they truly enjoy. If you have ever seen one of these events, you would have to agree that these dogs really love what they are doing. In 1999, I brought home a six week old puppy that we named Kasey. He is an English Springer Spaniel and was bred at Guadiara Kennels in Amanda, Ohio. Kasey was purchased to be used for hunting. He arrived at our home in the middle of the summer. The pup went along with me and my other ESS, Jake, to the river for some water work and exercise. As a small pup, Kasey showed a huge interest in retrieving and he was a fearless water retriever. He would literally leap off anything without thinking twice. This fearless trait is not always best for hunting dogs due to the possibility of injuries that could occur. I have been fortunate that Kasey has not injured himself and I am now very cautious with him. Due to Kasey's enthusiasm for jumping, coupled with his determination and drive for retrieving, I started looking for information on the Big Air Competition. How does a dog qualify to get to the Great Outdoor Games? Where are the qualifying events held? The questions were building and I had to find answers. One day I came across information that pointed me to a web site with details about the events. 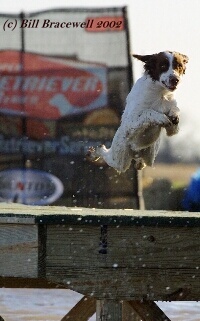 On the Dockdogs web site, I found a banner requesting entries for "Mini-Big Air" competitors. The organizers were trying to get enough dogs under 18" at the withers to jump in an Exhibition at the Great Outdoor Games. I knew that even with Kasey's drive and natural leaping ability, he could not compete with the big retrievers but a "mini" division would be a blast. In order for Kasey to get an invite to the Great Outdoor Games, he needed to jump in a regional competition. On March 9th, 2002, Kasey jumped in a Super Retriever Series event at Stuttgart, Arkansas. I was only hoping for a good showing from the "little white dog" - and to have some fun watching the other dogs compete. The dogs with the six longest jumps would qualify for the finals on Sunday, March 10th. Kasey's longest jump was 13' 7" and he slipped into sixth place out of 31 dogs entered in the competition. I could not believe that this little 41-lb dog was able to out jump those big retrievers! On the next day, after much anticipation and very little sleep, we were ready for the finals. Oh yeah, did I mention that the cameras were rolling and the event would be televised on ESPN2? Talk about nerves. Cameras were everywhere. Wireless microphones were on each handler. We were warned to be careful with what we said. After all, this was a televised family event. "...people had the chance to see how competitive a small dog can be in a "Big Air" competition."